When the fountainhead of the State’s governance, its chief minister overwhelms the need to hunt cow-killers over ‘cop-killers’, it crystallizes a practice in gross violation and rule of mob anarchy. Dressing the incident as an ‘accident’, that too four years after the incident and relegating a heart to heart with the victim policeman’s family after the end of his political slugfest in other states, speaks volume of the man holding the reins in the state. 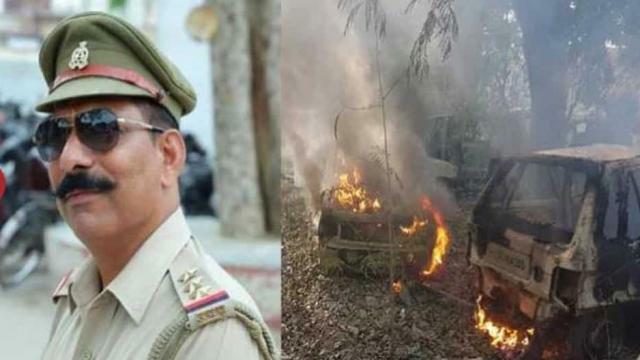 On Monday, a hostile mob of villagers of Mahaw, Bulandshahr, and gau-rakhshaks butchered in cold blood the station house officer (SHO) Subodh Kumar Singh. A young man Sumit, involved in the violence, was also killed in the cross fire. The vigilantes had put a blockade on traffic near the Police Station after carcasses of Cows were found in a village field. The whole incident was designed to set ablaze the area with communal conflagration as the district was holding a Muslim congregation of more than 15 lakh devotees. Thus, violence and opprobrium becomes political stratagems just like the Muzzaffarnagar riot (2013), a sure-shot ticket to seat of power as the CM himself would testify. Rajasthan polls may have been grounds for breeding another shot of sectarian viciousness in the neighboring state to help the State machinery hold on to power. It emboldens the volatile fringe and fattens their patronized impunity to inject its brand of poison and run amok with its programme of open and wanton terrorism. Yes, many find it hard to call it what it is… ‘Cow Terrorism’, an indelibly egregious and pungent strand of saffron terror. Police have booked 90 for the incident including members of BJP Yuva Morcha, VHP and the Bajrang Dal. This includes Yogesh Raj (25, Banjrang Dal activist), Sachin (35, BJP volunteer), Raj Kumar (36, former Pradhan) and Jitender Malik (24, soldier and alleged shooter). The prime accused and the main instigator Yogesh Raj is a Bajrang Dal (Hindu terror group funded by RSS) who registered the FIR. He claimed to have seen seven people slaughtering cows even though he lives 3 km away from the spot. The closest neighbour of the field owner contested his claims as he only saw the “carcasses” which seemed days old. Later Yogesh would conveniently redact his statement of course. Yogesh was claimed (by family) to be attending a college exam which his college expressly denied. His house has a strikingly saffron tinge and an unmissable map of Akhand Bharat at its helm. According to his family, he joined the Bajrang Dal ranks at the age of 16. He is still at large. According to eye-witnesses, Yogesh and his goons were men possessed and refused to be pacified even after assurance of investigation. According to the Bulandshahr’s district magistrate Anuj Jha, the place has no history of cow slaughter and the district itself has always implemented the cow protection directive sternly. Police and Chief Minister Adityanath have asserted that cow slaughter is the priority crime as there is a separate SIT for it. As a result, four Muslim men have been taken in custody with a total of seven accused that includes two minors, 11 and 12 year olds, four allegedly fakes names and three men from Delhi-NCR region. This is at the back of patently dodgy claims of Yogesh Raj and a complaint with more holes than a tea-strainer (pun intended). The dumping or stringing of multiple, 2 day old carcasses in one place which was different from the actual spot of the alleged slaughter (ADG’S report), all of it seems like a well staged and choreographed scene from a Noire movie. Followed by a clarion call to avenge the ‘alleged bovine murder’, congregation of weapon-laced 400 men from nearby villages like Nayawas and Chingrawathi, expeditious transport of the carcasses and setting up of a formidable blockade, ensuing melee and eventual chase, hunt and murder of a law enforcer in his attempts to lawfully investigate the murder sound more elaborate than even the greatest crime novels and macabre movies. Ironically, a mob hit has newer and much uglier connotations. There is no honour in these craven criminals hiding and lurking behind the anonymous and shadowy guise of a crowd. The insistence to parade the sacred remains of a holy animal would itself amount to sacrilege. The mob even stifled the villagers’ attempt to bury the remains and instead hauled them in their tractors and trolleys to instigate pandemonium at the Police station. Add to the flagrant fury, the fact that millions of Muslim devotees were camped in the city of Bulandshahr (nearly 40 km away Sayana) for the final day prayers at the Tablighi Ijtema. The plot gets grimmer and darker but it does not end here. The cop that was not spared by the terror fiends, Inspector Subodh Singh had played a crucial in collecting evidence and investigating the infamous Dadri lynching of Akhlaq in 2015. There are too many coincidences and a miraculous symmetry of sinister signs to overlook. And the ADG’s report confirmed the same, calling the incident ‘a larger and pre-planned conspiracy’, with the machination to put the region on communal flames by triggering a clash with the Muslim procession destined for the Bulandshahr-Garhmukteshwar State Highway after the culmination of Ijtema on Monday. The resistance of the crowd pointed to a deliberative attempt to degenerate the atmosphere and escalate the restive passions into violence. Baying for blood, the instigators were holding the fort in wait of the returning Muslims from the Bulandshahr Ijtema and possibly fomenting a riot. Cow Vigilantism has its own dark history and so does Cow-Politics. Historical writing suggests that even though the Holy Cow is leveraged easily to provoke sentiments and vitiate tempers in name of religious sanctity, beef and varieties of meat were a feature of the Vedic age and early India (territorial sense). However, with agriculture becoming the mainstay of Indian society, cattle became wealth worth protecting and hoarding. Agricultural requirement become more valuable than dietary needs and hence beef eating or ‘cow slaughter’ was revived in the 19th century AD as a grave and cardinal sin. The first riot or violent chapter occurred in Uttar Pradesh (United Province then) in 1893, when Muslims were forced to abdicate slaughtering cows on the occasion of Eid-ul-Adha. The Bulandshahr episode is not an inflection in the nature of intent. It follows a dangerous trend that seems spiraling out of control and succumbing to any deterrence. There was 2015’s mob murder of Mohammed Akhlaq. The mob dragged him and his son out of their own house and beat them up brutally. April 2017 saw a 55 year old dairy farmer in Alwar, Rajasthan named Pehlu Khan beaten to a point of death by a rampaging coterie of gau-rakshaks. May 2018 saw two men named Qasim and Samiuddin victimized by street terror when a mob lynched them to a forced confession of crimes they had not committed in UP’s Hapur. The scourge has become so cancerous that post 2014’s coronation of Narendra Modi and reemergence of BJP, the spate of such events has burgeoned unabatedly. 97% of all cow-vigilante attacks reported since 2010 have been orchestrated after BJP’s triumph in 2014 (IndiaSpend) hovering around 100 with 55% being targeted against Muslims. Obviously, nothing is as simple in reality. The way the entire system of such street justice functions is a lot more exorbitant but cloaked. With public harassment of minorities by the ruling powers not morally possible, these vigilante groups are hired to do the dirty job of roughing up the second class citizens (non-Hindu minorities). It is acted out as impulsive acts of alleged Hindus who are entitled to defend their religion from the foreigners (non-Hindus). Thus, the majoritarian sentiments are gratified by rearing such militant armies and utilized to wreak communal havoc at first and accrue political returns later. The moneyed capitalists are reciprocated for their lavish coffers by the political winners post such victories. There are hundreds of such groups in the NCR region alone exacerbating a contamination of manufactured phobia and ignorance. They have their own network of spies and informants like rickshaw-pullers, auto drivers, street vendors etc. and exploit the gift of social media to circulate their messages of psychosis and spite. In 2018 a 3-man bench of the Honorable Supreme Court declared such incidents of vigilantism or mob violence as crimes directing the state governments to ensure such acts are not allowed to take place. Earlier, in 2017, the court had asked the six BJP run governments in Rajasthan, Maharashtra, Gujarat, Jharkhand, Karnataka and Uttar Pradesh to reply a petition demanding a ban on the legislative protection of cow-vigilante groups committing hate crimes. The petition nominated sections like section 12 of the Gujarat Animal Prevention Act, 1954, and other such laws, as unconstitutional as they provide immunity to people perpetrating murder under the guise of good faith. In 2016, PM Modi did condemn such ‘Gau-rakhas’ and called them fake (against Dalit Hindus) but true to his skin selectively weaned out any mention of vigilante attacks on Muslims. In the Bulandshahr Tablighi Ijtema, held in the Dariyapur village of the district, record numbers thronged the scene with the desire to educate and realign themselves to the faith prone to misrepresentation and misinterpretation by popular media. The three-day Islamic congregation received in excess of 20 lakh devotees from various parts of the country and the World. However, several eyewitnesses claim an unprecedented haul crossing the crore-mark. There was a battalion of volunteers managing the affairs, accommodation and directing traffic. The largesse of food, supplies from hundreds of homes dotting and circumscribing the Ijtema was a feat in its own. The local police and administration did an impeccable job in ensuring no flashpoints even though there were few motorcycle-riding, saffron-clad, loud mouth hooligans from Shiv Sena trying to muster trouble on the first day, it was all handled in a text book manner. Monday was the end of the gathering and the day of the collective supplication which invited a greater attendance that the first two days. Of course, the heroic martyrdom of one Subodh Kumar, some 40 kms from the site of gathering, further elevates the significance of the entire chain of events. What is Tablighi Aalmi Ijtema? Ijtema is an Arabic term meaning ‘global or world congregation of people’. In such conference several Islamic scholars and preachers educate Muslims about the fundamentals of Islam like the text of Holy Quran , sayings and practices of Prophet Muhammad (PBUH), his Seerah or biography, salience of Salah (daily prayers), Zakah and Sadaqah (charity), virtuous good conduct, obligations to family, orphans and destitutes and Ummah (whole community) etc. It serves as a reminder about Deen (religion), Dunya (physical life) and Akhirah (Hereafter). It ends with the Dua’a or collective suppication asking for Hidayah (divine guidance) and the betterment of individual and the entire Ummah. Historically, it originated from the Deobandi Movemnt and aimed to revivify faith in Muslims and non-Muslims through Dawah (proselytization). There has been some criticism about their isolationism and apolitical nature but it is often from the people who are not involved in the Dawah work. This assumes greater value in the current atmosphere of radicalization and hate-indoctrination of Muslims by un-Islamic forces like ISIS, anonymous internet warriors etc. Such programme of scholarly insight and enlightenment helps the crusade against proliferation of vitriol, propaganda, bigotry, maliciousness and ambiguity. I hail from Bulandshahr and was travelling through Sayana the night before it was consecrated with national attention. The roads were teeming with ebullient and hopeful devotees much like other pilgrims yearning to meet their destination. We had to take uncharted course through the fields. They were dark and unusually quiet but we got no whiff of the trouble to come. Unfortunately, there was menace brewing in the fields. Vicious and virulent, they were to spawn a blackness that would be hard to expunge for the state, its law makers and its custodians. The lady of Justice has always been blindfolded but this time it was publicly and wantonly abused and ripped apart by fearsome spite, arrogance and disdain. Brave is the man who confronted his death dauntingly, when craven submission would have been accepted if not desired. When the seemingly conspiring or blatantly insipid brothers in arms deserted the man, he faced his murderers with unrivalled gallantry. According to a hadith of Prohet Muhammad (PBUH) the ink of a scholar is more sacred and powerful than the blood of a martyr. Through my words I hope to pay tribute to and sacralize one such martyr. His courage and sacrifice proved to be a wall against the scalding venom of hate and division. He was a provider for a few but in an instant became a shield for many and an example for many more. On the flipside there is the curious case of Sumit, the other casualty of the fracas. He was killed by a bullet wound from a 0.32 bore weapon, akin to Inspector Subodh Kumar Singh’s bullet wound. Interestingly, the police were using .303 bore. A person who partook the stone pelting, a perpetrator, was rewarded Rs 10 lakh compensation (raised from Rs 5 lakh on CM’S personal interference), ex-gratia honor for his actions. This kind of reprehensible and purportedly selective appeasement amounts to rewarding terror, venerating hate, garlanding violence and exhorting murder. To place the killer and the martyr on the same pedestal is a matchless low even for the Yogi regime. It is a damnation that must aggrieve every person donning the khaki uniform and discomfit every person carrying a flame or flag for the country. If he had a beard, wore a skull cap, the stone-pelting would have certainly led to no such valediction for the individual or benediction for his survivors. Political ambition often rides popular benefit roughshod and crumples the humanitarian for the sensational, but this time it was a rabid assault on not just a community but all of them, a internecine war for poisonous incubation, a desecration of law and order, a challenge to the very constitutional state that we gave our blood to free and forge…One cannot avoid the abject and despicable irony!